Tonight's movie for #undeadOctober is a love story. Yep, you read that right. It is a simple, boy meets girl, boy eats girl's boyfriend, boy and girl fall in love, boys heart starts beating (again). Sounds like a classic tale right? It might sound a little strange, but it is one of my favorite movies. 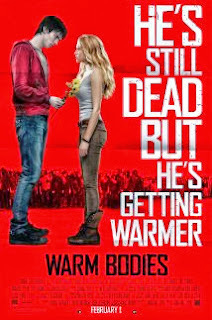 Warm Bodies is based on the novel with the same name. You can check it out on Amazon if you are interested. I have not actually read the book yet, but it is on my Kindle so hopefully I will read it soon. I am really interested to see how close the movie follows the book. I have heard this movie called the Twilight of zombies, but I think it is much more than that. I think this is the perfect date night movie for zombie lovers out there. It has a lot of really great comedy, character development, plot twists, and action scenes. Maybe I like this movie so much because I think Rob Corddry is the bomb, but my stance on this movie still stands. I give it a 5/5 because it is one that everyone should watch. The worst thing about the movie is one of the things that makes it so approachable by so many different types of movie goers. It is the way the zombies are "cured" and it can really be hard for some people to get past. Going to just spoil it now and tell you, so stop reading here if you don't want to know how they come back from being zombies. Ok, are you ready for it? The zombies are cured by love. As soon as they start to feel feelings again, they start to turn back to normal and their heart starts to beat. Right there, that is almost a deal breaker for me. I mean, the zombies have huge wounds and have gone without any real food for a long time. Seeing a pretty girl somehow fixes all that? I don't think so! And the same problem continues into the "bonies" who have gone so far that they gave up on life. They tear off all of their skin and this somehow makes them, not die for one thing, but also gain extra speed and strenght. Why do I have such a big problem with that part? It is pretty simple really. If it is a virus, fungus, bacteria, or anything along the realistic lines of zombie outbreaks, then finding true love would not start your heart beating again. If they would have just mentioned something magical, alien, or something else outside of the realm of possible then I might be able to go along with it. If the zombies would have been created by say, mans own growing hatred for itself and society, which then causes people to start going mad and kill each other then finding true love would make sense. Or if it was some kind of curse and they just needed to have the one thing happen that seemed the most unlikely like a kiss from a girl (thinking frog prince here). Anything like that I would have been fine with, but by showing that they are medically dead, have no heartbeat, are forced to eat humans, and can survive without water, they can't just see someone and come back to life. It just goes too far. Rant over. Time to talk about the zombies a little bit for my zombie review. They have a heightened sense of smell that allows them to track humans. They have the strange ability to read another person's thoughts by eating their brains. They do not bleed and do not feel any pain. They also do not sleep, which means they also lack dreams. If they stay in that state for too long, they eventually become bonies. The bonies eventually run out of energy and die so the zombies are not immortal. I have such a love/hate relationship with this movie. I still really like it even with all of my technical complaints about the zombies. This movie still makes a great date night movie and I am sure that my wife and I will be watching it many more times. Don't let my comments get to you because it is still a great movie. That is all for tonight. Check back tomorrow for another zombie review!